Time to play: 20 minutes. A year ago we reviewed the crazy Loony Quest. In Short we absolutely loved it. You can read our review here. It’s been a firm family favourite of ours. This game works so well due to how accessible it is. Mostly because there are very few rules to learn and it’s a joy to pick up and play. Imagine our delight when we found out there was an expansion. We like expansions. 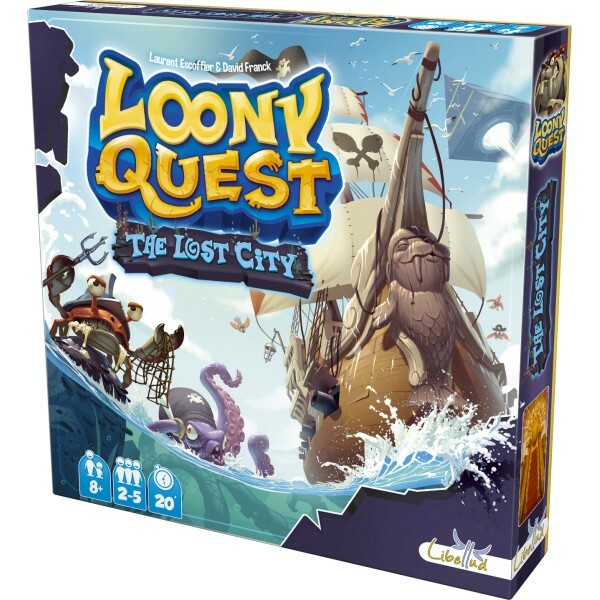 The Lost City takes place after the Arkadia championship in Looney Quest. The contestants have been captured by Vadoor - King Fedoor’s exiled evil brother. You play the adventures trying to flee their captors and protect Arkadia. David: Yes it’s nice when an expansion adds something new this one adds a 3D pyramid spaceship! I was hoping for some more levels as we have played the original quite a bit now. The new worlds added are Pirate, Nautilus, Abyssal, Spectra and Vortex. Spectra is the world that uses the 3D pyramid and it’s very difficult. Mike: The Pyramid levels are the best of the additions however they are very challenging especially for younger players. 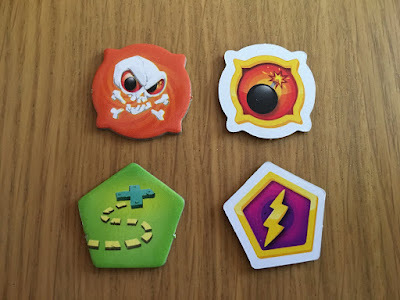 The game also adds two new tokens a new bonus where you can place an x on your marker board before you play as a guide. There is a new curse penalty which if drawn makes you draw an additional 2 penalty tokens. Personally, I thought there could have been a few more bonuses and penalty tokens but what we really want are the new worlds. David: I agree and the new worlds are awesome they have portals lasers and secret passages. These worlds are a lot harder than the worlds in the core set. This really is an expansion to play after you have mastered the first set of levels. Mike: But it’s that extra challenge that keeps you coming back for more. As expansions go it doesn’t look like a lot. You then realise how tight some of the levels are and how much replay value you will get. To give you an example of how difficult it is this is the boss from world 11 Spectra. Now you need to make 4 lines starting from the gun in the lower right corner and ending up on one of the four green containers on his back and head. Oh, and you also need to circle the two rockets he has shot at you. Easy yeah! Now try it with this pyramid on top. Now you get why it’s so difficult. This was my attempt and I had to do it with one eye closed as well that’s the penalty token I have in the picture. Again as we mentioned in our first review watching your family attempt these challenges with an eye closed and using their other hand to draw results in some hilarious attempts. If you own the original you can’t go wrong by purchasing this and increasing the longevity of this awesome filler game. The only thing I didn’t like was how flimsy the 3D Pyramid was after a fair few plays I can see it breaking it’s not very strong. David: Totally agree, fully recommended by Board Know More. Another great review. Took me until the 2nd review to work out what the pyramid is for - you place it on top after placing the picture, to obscure it? I've still not played Loony Quest but I'm very keen to do so!